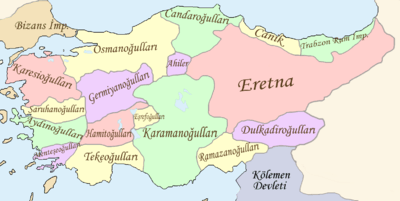 The Ramadanids, also known as the Ramadanid dynasty, Emirate of Ramadan, Beylik of Adana, and Ramadanid principality (Modern Turkish: Ramazanoğulları, Ramazan and Ramazanoğulları Beyliği), was one of the Anatolian beyliks. 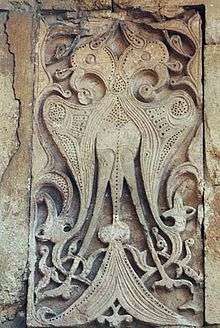 Its capital was in Adana. It was one of the frontier emirates established by Oghuz Turkish clans after the decline of Seljuk Sultanate of Rum. Because of the Mongol invasion Turkmens started migrating into Anatolia in great numbers. The Mameluk sultan gave them the right to settle from Antioch to Gaza. In return Turkmens became a great help in battles against Crusaders and Mongols. As a result of Abu Sa'id Bahadur Khan's death, Turkmens turned their eyes on Cilicia and they started to settle the provinces which they captured. With the help of the Mameluks in 1360 Adana and Tarsus were captured, leaving only a few castles to the Armenians. Ramazan Bey, from the Yuregir clan of Oghuz Turks had founded the emirate and made Elbistan the capital. However, after the conquest of Elbistan by the Emirate of Dulkadir, the capital was moved to Adana. Longest surviving among the Anatolian Beyliks, "Ramazanoğulları" (1352 - 1608) was established in the historical Cilicia region of Anatolia. In 1375, Ramadanids destroyed the Armenian Kingdom of Cilicia in the name of the Mamluk sultan of Egypt, this became the core territory of the Ramadanids. After the death of Ramazan Bey, his son Ibrahim Bey made alliance with the Karaman Emirate. Alaeddin Bey and Ibrahim Bey together tried to break the Mameluks' might in the province. After this alliance a great Mameluk army moved in and began to plunder but Ibrahim Bey's army achieved a great victory against the Mameluks in Belen. Also in this battle Temur Bey, the general of the Mameluks, had been captured. Yilboga, the amir of Aleppo moved on to the Turkmens after this defeat and he conquered Misis Castle. The Ramadanids played an important role in 15th century Ottoman-Mamluk relations, being a buffer state located in the Mamluk al-'Awasim frontier zone. 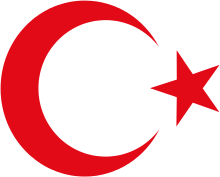 In 1516, Selim I incorporated the beylik into the Ottoman Empire after his conquest of the Mamluk state. The beys of Ramadanids held the administration of the Ottoman sanjak of Adana in a hereditary manner until 1608, with the last 92 years as a vassal of the Ottomans. The dynasty remains prominent in Turkish society to this day. Ramazanoğlu Hall, which is used currently as a cultural center, was the state residence of the Beylik. Administration hall of the Beylik does not exist today. Wikimedia Commons has media related to Ramadanids.